Essentially Surround Sound is 3D sound. It is sound that surrounds you by 360 degrees. Each speaker has its own purpose. Starting with your centre speaker where it’s primary use is all of the speech and talking. The Main Speakers located on either side of the picture pointed towards the seating arrangement. You can have 2 or 4 speakers behind you, depending if you have a 5.1 system or a 7.1. 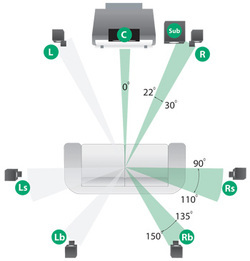 The point 1 means your subwoofer or base sound. And yes you need all of them to create the correct affect. There are larger options, right now Yamaha has an 11.2 amplifier and what they do is use a matrixes extended surround where the left and right channels are split to create a more full feeling it sounds fantastic. The heart of every home theatre is an AV Receiver. It is designed to be the brain of what equipment you have purchased and make the video and digital sound go to the correct place. You want the movie experience you need one of these. If you have a knowledge of this than feel free to set it up yourself, but you will save a lot of time to get someone to come in and do it professionally because they will make it user friendly and calibrate the sound to suit the room it is in, to the best of its ability. I have a couple of examples of what 5.1 and 7.1 look like but rooms don’t necessarily have 4 walls located like the diagram is, or where the door is located etc. 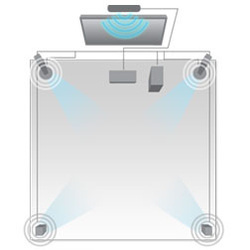 In some examples the exact degree’s where you set up your speakers may change as the shape of the room may not allow it, and the primary seat may not be the most used……..so the room may need to be adjusted to accommodate every seat in the room. LOVE MUSIC CHECK OUT SONOS!